We will reimburse you for up to $100 of local alterations per suit + shirt. In the rare occasion your suit cannot be altered, we will remake it for you free of charge. We want you to love your suit. While 80% of our customers get their preferred fit on the first try, fit can be subjective or sometimes measurements will require some tweaking. If you believe your order needs some adjustments to achieve your perfect fit, our Winnipeg and Calgary showrooms employ in-house tailors who will be happy to complete them for you. If you don’t have a local Eph Apparel location with in-house tailoring, we will reimburse up to $100 per suit and shirt per order for local alterations at a tailor of your choosing. If you have any questions or concerns with the fit or quality of your order please email us at [email protected] or call 1-888-343-6117 and let us know within 10 days of receiving it, and our team will help you through the process. Let our service team know you will be taking your garments to get altered within 10 days of receiving your order, prior to proceeding. If you need some fit advice we will be happy to help! Visit a tailor of your choosing. Ask the tailor to fill in the Flawless Fit Guarantee form included with your order indicating which areas you had adjusted indicating how any inches were added or subtracted using a + / -. For example, if your Pant was 1.25″ too short the tailor would fill in +1.25″ in the pant length field. Did you know: both our Winnipeg Storefront (190 Smith Street) and Calgary Storefront (815 10th Ave SW) operate with on-site tailors that would be happy to assist with your alterations. 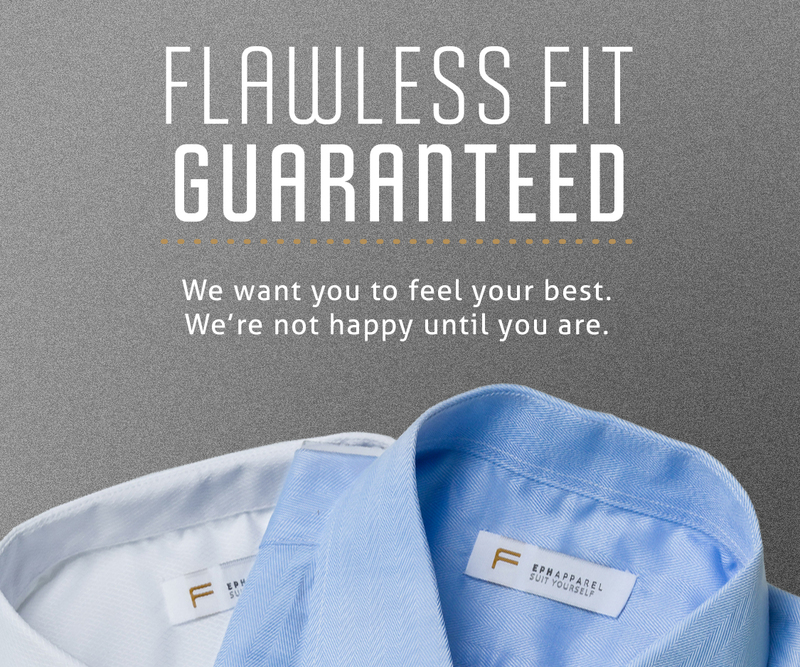 How long do I have to submit my Flawless Fit Guarantee claim? To receive reimbursement for alterations, you must let a member of our team know within 10 days of receiving your order that you are experiencing issues and then have the work completed and the claim submitted within 30 days of receiving your order. Alterations will be reimbursed up to a maximum of $100 per suit + shirt order. If you believe your alterations will exceed the amount or you may have difficulty submitting your claim prior to the 30-day mark, contact our team prior to having your alterations completed. Submit your itemized receipt and alterations form on the orders section of your profile or email to [email protected] Remember to let us know you will require alterations by email or phone within 10 days of receiving your order prior to proceeding with alterations. Alterations will be reimbursed via e-mail money transfer, or in the form of store credit if preferred. If you do not use online banking reimbursement can be offered via PayPal. My alterations will cost more than $100 - what should I do? Eph will only reimburse alterations up to the stated amount. If you think that your alterations will exceed the reimbursement amount, contact our support team prior to proceeding. If you proceed without speaking to a member of the Eph support team, you will only qualify for reimbursement and forgo your right to have that garment remade. How do I change my measurements if I got alterations? Visit the orders section of your profile. Once your alterations are completed and submitted to our support team, we will update your measurement profile for future orders. Login to your profile to see your measurement history. If you have any concerns with the fit, quality, or construction of your order please contact us within 10 days of receiving your order and we will ensure that we resolve any problems you might be experiencing. We are here to help, and sometimes the perfect fit requires a little extra care. If a garment cannot be altered, or the scope of the alterations will exceed the $100 reimbursement credit we are happy to work with you to adjust your measurements and remake the garment. To initiate a remake, please contact us with a description of the issues experienced and photographs to illustrate. For standard fit issues, please include (3) photos of the garment(s) while standing in a natural and relaxed pose from the front, side, and back. For specific issues please include supplementary photos highlighting the problem. E.g.) If your collar is too tight, send us a closeup photo with the button done up. This will allow our team to properly assess the garment, and provide suggestions on the best way to fix it. Remake orders are submitted on a rushed timeline of 3-4 weeks, and we reserve the right to deny a remake request when we know that a garment can be fixed with alterations locally. Remakes cannot be initiated on the basis of customization changes. If the fabric required for your remake has fallen out of stock, you may be asked to select an alternate fabric. Do I have to send photos? Yes. In order for us to be certain we can alleviate your concerns, we must see how the garment fits and make the proper adjustments before we can remake it. Our support team has worked with thousands of customers using this method and photos are enough to fix the problem in the vast majority of cases. How do I get a remake?